Taking a practical approach, The Telecommunications Handbook examines the principles and details of all of the major and modern telecommunications systems currently available to industry and to end-users. It gives essential information about usage, architectures, functioning, planning, construction, measurements and optimisation. 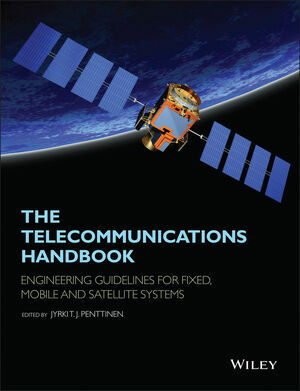 The structure of the book is modular, giving both overall descriptions of the architectures and functionality of typical use cases, as well as deeper and practical guidelines for telecom professionals. The focus of the book is on current and future networks, and the most up-to-date functionalities of each network are described in sufficient detail for deployment purposes. The contents include an introduction to each technology, its evolution path, feasibility and utilization, solution and network architecture, and technical functioning of the systems (signalling, coding, different modes for channel delivery and security of core and radio system). The planning of the core and radio networks (system-specific field test measurement guidelines, hands-on network planning advices and suggestions for the parameter adjustments) and future systems are also described. An essential reference for Technical personnel at telecom operators; equipment and terminal manufacturers; Engineers working for network operators.